Students from Millbrook Junior High School’s 5th grade class enjoy their victory pizza party. CHS Elburn partnered with Millbrook Junior High School to help fill local shelves. Millbrook Junior High School students raised over 400 pounds of food, approximately 445 items, for CHS Harvest for Hunger annual food, funds and grain drive organized by the Country Operations division of CHS, the nation’s leading farmer-owned cooperative. Since the launch of CHS Harvest for Hunger drive in 2011, more than $4.7 million and 3.4 million pounds of food have been raised. The food drive was a competition among grade levels with the school’s anti-bully group running the competition. Daily totals announced over the PA system encouraged the students to continue to bring in donations to help their class. 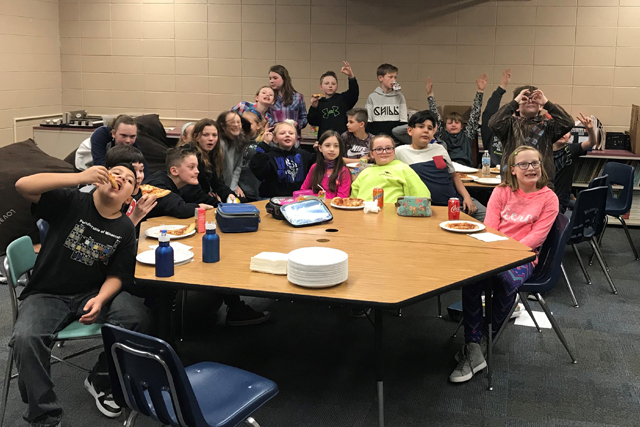 The 5th grade class collected the most items and received a pizza party provided by CHS Elburn. CHS Elburn locations also collected non-perishable donations at its facilities. This year the cooperative, combined with the donations from Millbrook Junior High, raised just over 700 pounds of food. The food was distributed to pantries in the communities we do business in. CHS also sponsors the National Ag Day essay contest, awarding $1,000 scholarships to two students submitting the winning written or video essays. Food insecurity exists in every country in America, according to Feeding America, but food insecurity is generally higher in rural households than urban. And one in six children in the U.S. face hunger. Since 2011, CHS has raised more than $4.7 million and 3.4 million pounds of food through its Country Operations business units. 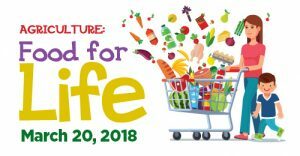 Again this year, CHS locations across the United States are planning fun and interactive ways to rally the communities where they live and work to raise food and funds to fight hunger. CHS Elburn will accept non-perishable goods from March 1 through March 20 at the following locations: Sycamore Agronomy, Sycamore Main Office, Elburn Office, Meredith Road, Newark Agronomy and Newark Grain. The food will be delivered to local food pantries.. When rural communities work together, they make a huge impact in the lives of those in need. CHS Elburn is gathering donations of food to help fight hunger. As part of CHS Harvest for Hunger food and fund drive, CHS Elburn will accept non-perishable goods from March 1 through March 20 at the following locations: Sycamore Agronomy, Sycamore Main Office, Elburn Office, Meredith Road, Newark Agronomy and Newark Grain. The food will be delivered to local food pantries. Hunger is a reality for more than 40 million people in America, including 13.1 million children. Every pound raise through CHS Harvest for Hunger will go to local shelves to help friends and neighbors right here in our community. Help us fill the shelves by dropping off a donation at a location near you! CHS Elburn is pleased to announce the election of two new members to our Board of Directors: Roger Nelson and Kent Kleckner. Nelson and Kleckner were elected to a three-year term on the 7-member board at the CHS Elburn Annual Meeting on Feb. 12. Kent Kleckner began farming in 1994 with his father in Maple Park, Illinois. In 2011 his father retired, and Kent is now farming 1,400 acres of corn and soybeans. He graduated from Joliet Junior College with a degree in Agricultural Business. CHS Elburn would also like to thank outgoing board members, Ed Gorenz and Mark Schramer, for their time spent on the CHS Elburn board.